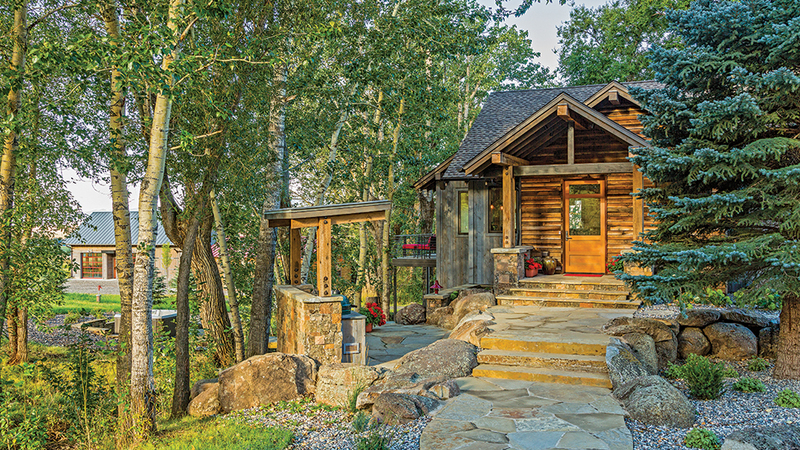 Transforming a failed renovation into a rebuild, a couple capitalizes on a breathtaking location with a charming timber cabin. The stunning results speak for themselves. When life gives you lemons you make lemonade, and when it gives you a 1900’s farmhouse with flawed bones but a prize location and million-dollar views, you rebuild. 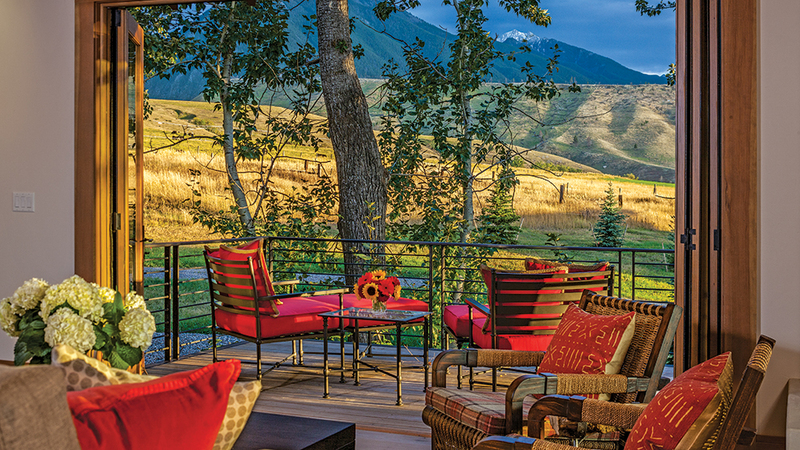 That was the philosophy of the homeowners of “Lazy Heart,” a modern-rustic timber getaway on a gorgeous stretch of land in Montana’s aptly-named Paradise Valley, not far from Yellowstone National Park. 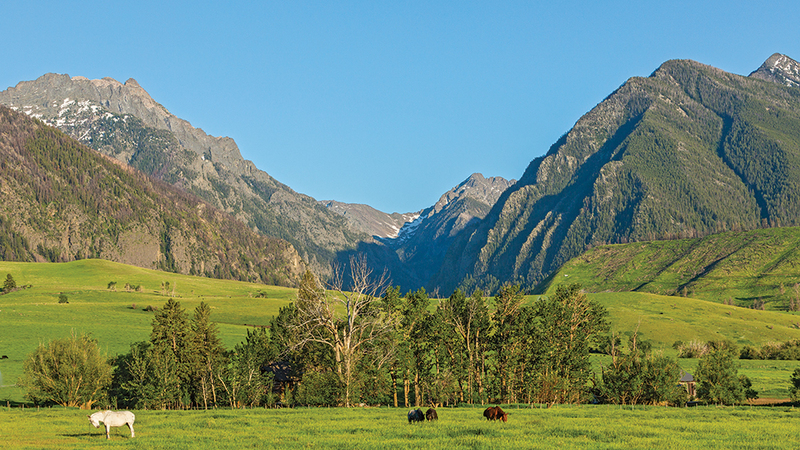 Against the astounding, almost mystical backdrop of the Absaroka Mountain’s craggy peaks reaching 10,000 feet into deep blue skies and alongside the clear, even bluer waters of the Yellowstone River, the timber-and-stone cottage could easily be overlooked. From the start, the couple planned to keep the impact to the home’s site minimal. The whole renovation project started out with plans to add a small addition to the hundred-year-old house, but the deeper they got into the process, the clearer it became that a fresh start was a must. “When we removed the siding, we uncovered major structural deficiencies,” explains builder Tim Rote of Dovetail Construction. 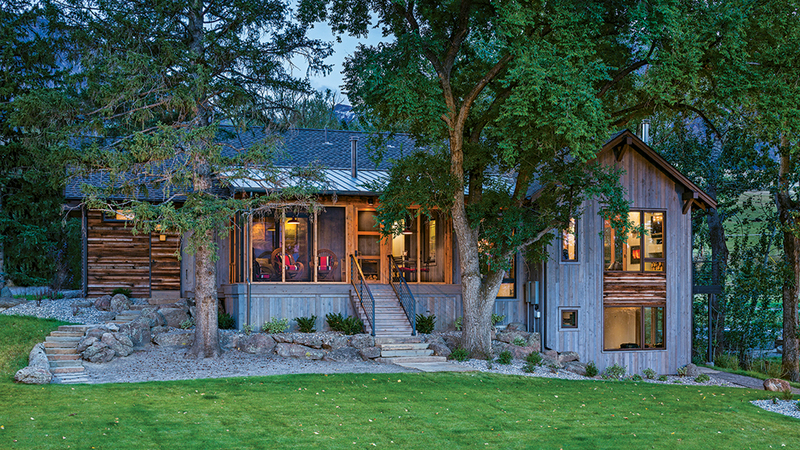 Reclaimed wood, gray vertical barn board siding and dry-stack stone combine with subtle steel details and metal roofing to create a structure that looks like it has grown into its present state organically over time. “Because the setting is so natural and really enclosed in this wonderful way with all the trees, we intentionally chose some vibrant colors to make it pop,” says interior designer Laura Fedro. A Southwestern-themed rug warms up the space and sets the tone for more jolts of color from the yellow and red accent pillows. 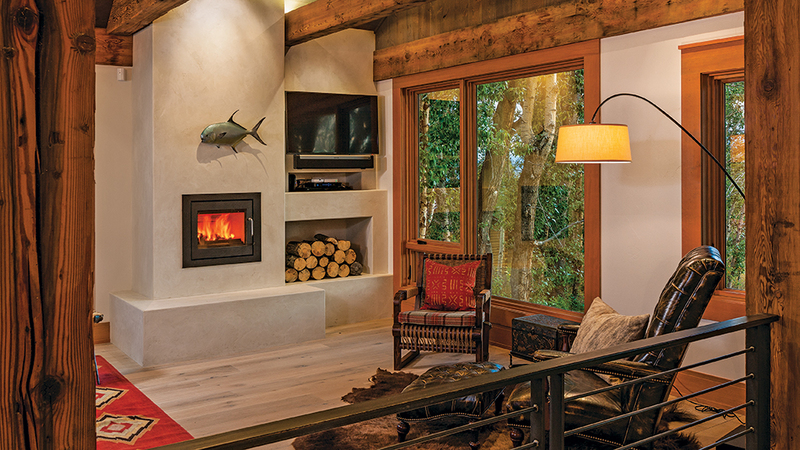 Architectural concrete and an angular design puts a fresh take on the fireplace, which relies on radiant heating to keep the house cozy during the long winter months. 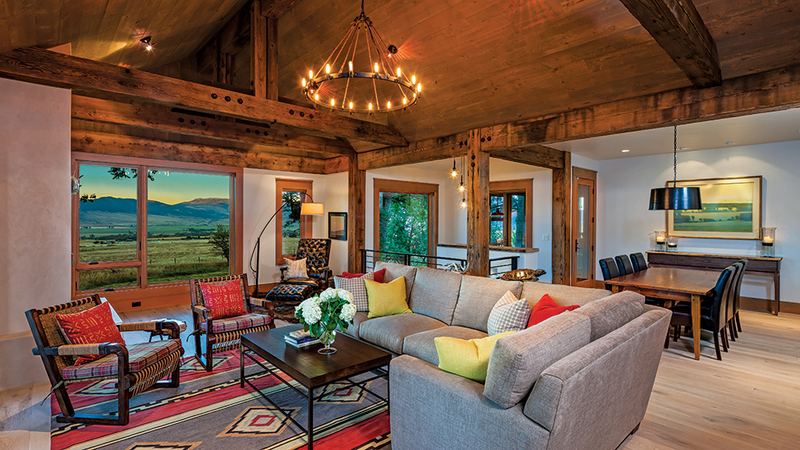 Bi-fold doors disappear to connect the great room to an elevated porch with a southern exposure and views of Yellowstone National Park in the distance. Concealing the refrigerator with wood paneling and wrapping the range hood in the timbers used in the rest of the kitchen help the open concept flow seamlessly into the adjoining living areas. 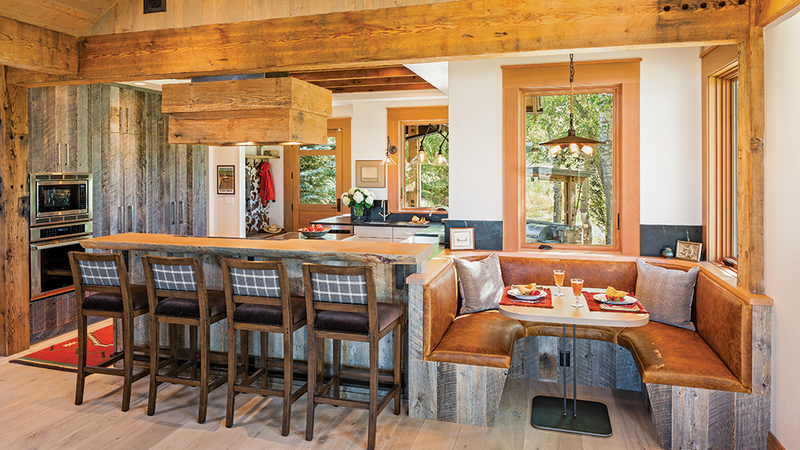 Supplementing the casual dining counter, a leather-and-wood banquette ensures plenty of seating at mealtime. 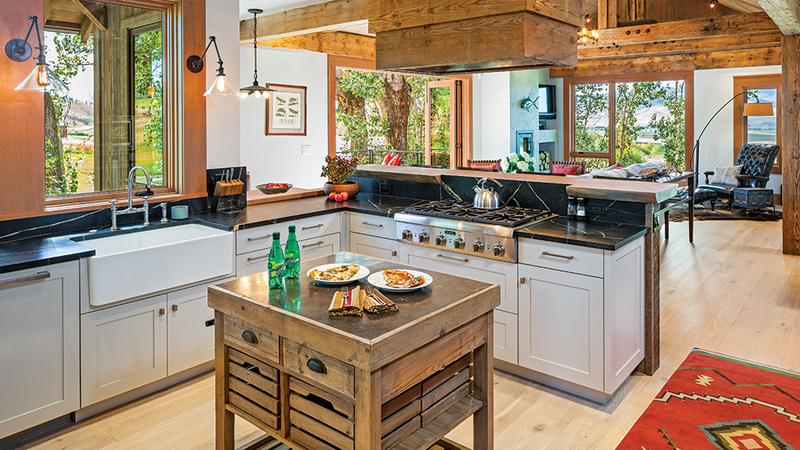 White cabinetry, sleek black countertops and stainless steel appliances give the kitchen a modern feel, while charming touches like industrial-style lights and an apron-front sink pay homage the home’s farmhouse roots. 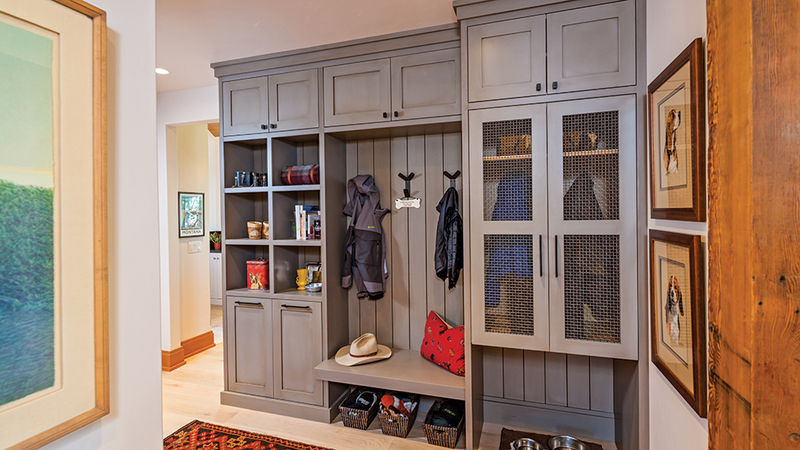 Just off the home’s entry, built-in lockers help the family corral coats, bags, shoes and more. Smaller cubbies up top create the perfect spot to stash on-the-go items, like keys and sunglasses, while a larger one down below serves as a dog feeding station. 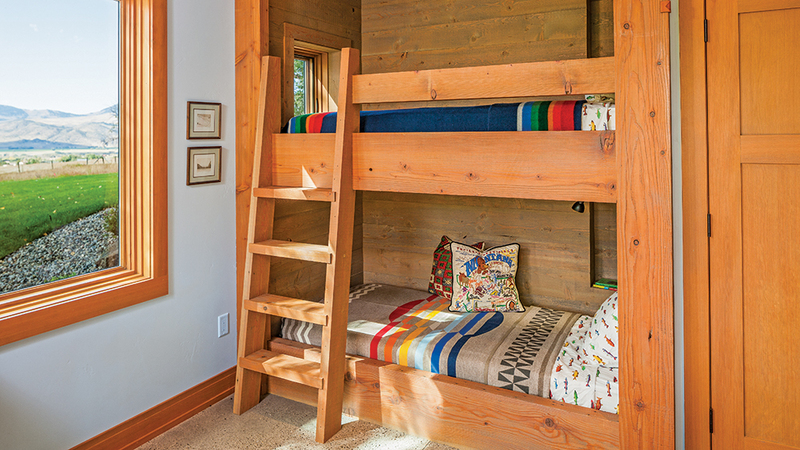 Bunk beds in the home’s lower level are made of re-sawn timbers. “Cutting off the old timber surface gives them a smoother feel and appearance but maintains some character,” explains the home’s builder, Tim Rote. Regionally themed bedding adds color to the wood-dominant space. 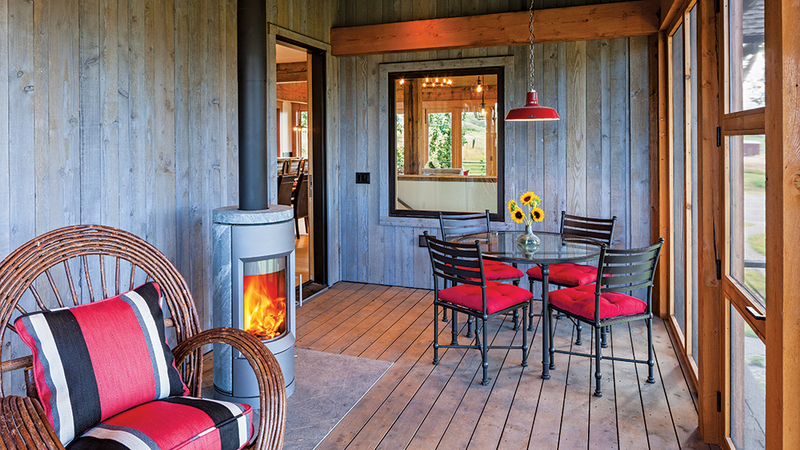 A screened-in porch framed with reclaimed lumber is accessible off of the great room and master bedroom. It’s a favorite spot for a morning cup of coffee next to the soapstone fireplace.